[vc_row][vc_column][vc_single_image image=”2106″ img_size=”full” alignment=”center” style=”vc_box_outline”][/vc_column][/vc_row][vc_row][vc_column][vc_column_text] Morgan and Ruby came to Manning in 1929 to teach school. Dad was a superintendent and mother was a teacher. They taught here until the end of the school year in 1935 after the mill burned on January 3rd. They then moved to Shawnee Prairie, farmed and taught school up there, which was 3 miles away. In 1941, my Mother and Dad bought the old mill site, two lakes (the upper reserve lake and the mill pond), the “old house” (which was the only painted house in town), 1,200 acres of land and all of the sawmill ruins from Leannah Gibbs, the widow of W.M. Gibbs. 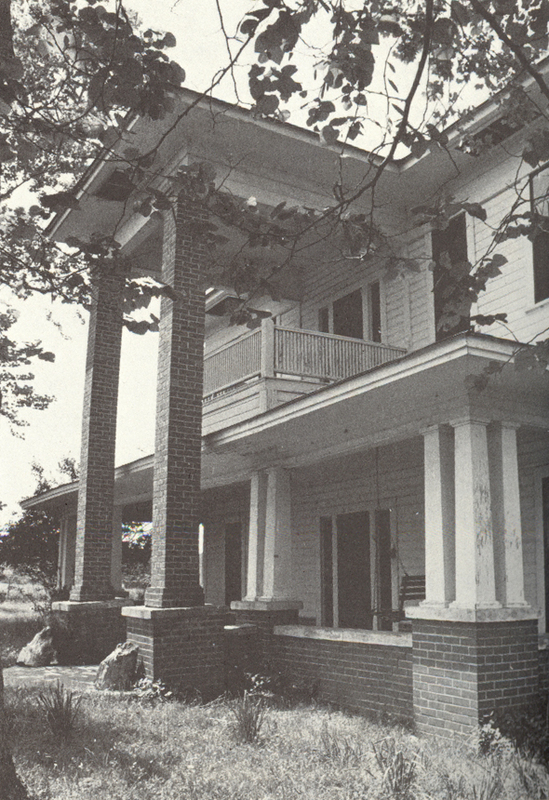 He was the mill manager and builder of this house that we now are calling the Mansion on Sawmill Lake. When we moved into this house in 1941, it had electrical fixtures and switches but no power because all the power had been generated by the sawmill as DC electricity. So, we had no electricity or running water until about 1950 when the Rural Electrification Association brought a power line all the way to Manning. 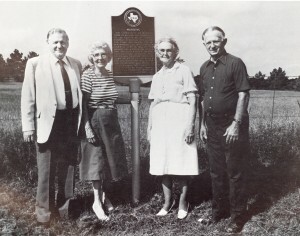 Manning was first settled in about 1867, two years after the civil war, as a small lumber camp but it grew to become the second largest town in Angelina County, next to Lufkin. In its heyday, it had approximately 1,500 people and was one of the largest southern yellow pine sawmills in the South. The sawmill burned in 1916 and was rebuilt and then caught fire again on January 3, 1935. After that, it was never rebuilt. Most of the houses were torn down and the lumber moved to other locations. The sawmill equipment, that could be salvaged, was shipped to Camden, Texas. Some of the iron dollies were apparently shipped to Japan and may have been used to make bullets to fire back at us later on. Manning and the Carter-Kelley Lumber Company was a bustling, industrial complex that was built in the heart of huge long-leaf pine forest lands owned by the company. Once the timber land was cut over, it was not replanted and eventually it was more economical to move the sawmill to another location where there was timber than it was to rebuild it. Some people call it a ghost town. 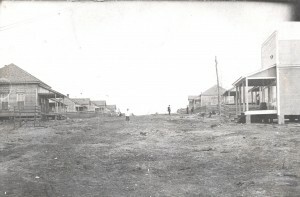 It wasn’t really a ghost town to me because we lived here and the wonderful stories of the people and events that occurred in Manning lives on in our memories and hearts. Evidence of the railroad that serviced this town is obvious from many of the railroad trams that remain. The railroad, the Houston, Shreveport and Gulf Railroad (better known as the Shove Hard and Grunt railroad) connected to the Cotton Belt and the Texas and New Orleans railroad at Huntington. When I was born, there were only two houses left in Manning. The “old house” and the “teacherage”, where my mother and father had moved to in 1929 after graduating from Stephen F. Austin. They met at SFA when the doors were opened for the first time at the University. They fell in love and married in 1923. When mother died in 2009, she was the oldest living graduate of Stephen F. Austin University. We named one of the rooms in the old house the SFA Room and one of the rooms as Miss Ruby’s room in their honor. We also named one of the rooms after Leannah Gibbs. After the mill burned, Dad began cotton farming, had a couple of cotton gins and a general store at Shawnee Prairie. My brothers, Morgan, Don, and Tom worked extremely hard. Mother and my wonderful sister Judy prepared three large meals a day, cleaned house, washed clothes by hand and milked a cow twice daily. Don’t get me wrong, it was a wonderful life. We were not rich by any means, but we were wealthy in our relationships and our work ethic that allowed us all to become successful in our individual lives. We had an amazing family, built around Christian principles and values, taught us by our parents who were married for 65 years when Dad passed away in 1988. [/vc_column_text][/vc_column][/vc_row][vc_row][vc_column width=”1/2″][vc_gallery type=”image_grid” images=”2114,2113″ img_size=”medium”][/vc_column][vc_column width=”1/2″][vc_column_text]In 1960, I met my bride-to-be at college. Genie and I married in 1962, raised three children, who collectively have produced 6 grandchildren for us. In 1979 we had an encounter with the Lord that has motivated us every day. Our first and foremost goal is to please, trust and honor God in all we do. He has been extremely faithful and gracious to us, prospering our family for over 53 years. After my mom died, I bought the “old house” from my siblings. Genie and I found our answer to a dream when we decided to use our old home as a bed and breakfast and a wedding venue. This gives us a ministry to provide rest, relaxation and renewal to weary folks and a great place for a man and a woman to begin a wonderful life together. I love Manning and you will too. I am anxious to share it with all who will come and experience this place that I call home.